Most everyone knows Robert Kiyosaki; yes, the author of the best-selling book Rich Dad, Poor Dad. And for those who know him seem to either love him or hate him. Yet as many people hate him, Yahoo still runs his column. Ignorance isn’t hard to sell. Recently, Kiyosaki wrote an article about silver, but a lame article filled with generalities and hypocrisy. Kiyosaki’s hypocritical views are a reoccurring theme in his writing–and why not? Say whatever sells more copies of Rich Dad, Poor Dad. 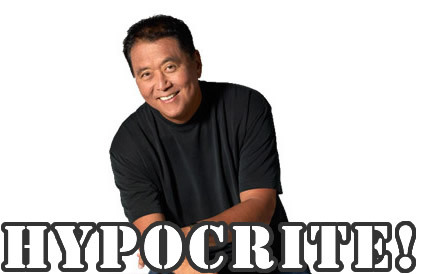 Even if Kiyosaki’s hypocrisy costs his dedicated readers the small amount of money his readers still have. Kiyosaki claims to be a “silverbug,” but who isn’t a silverbug when your trying to sell them some book? Kiyosaki claimed to he began investing in silver as “a 10-year-old boy,” one of his famous childhood stories. His stories from childhood are his favorite selling strategy; his books are filled with entertaining stories. Each story he tells gives no information; it’s only for entertainment. His ability to entertain the reader shows the main reason anyone reads his work: it’s fun. His articles and books amuse, but void of any substantial educational value. Which leads to the main idea, Kiyosaki does nothing more than sell low quality writing. He himself doesn’t believe what he writes. As if to sell a book, Kiyosaki writes and says anything. And when he says anything for a sale, he has a hard time keeping what’s true–and what he said a-year-ago. Take for example, his most recent entertainment at Yahoo Finance. He says, “[silver] is about to become the most spectacular investment in recent history.” And I agree, silver is the consumable industrial product, silver supply is down, and silver is a safe haven–increasing the returns an investment portfolio can make. What I disagree with, he’s constantly flip-flopping, pushing poor financial advice. How can he say in Rich Dad, Poor Dad, an investment is only an asset if the asset puts money in your pocket, and then turn around and give ‘advice’ about investing in silver? Oh, that’s right, hypocrites can. I agree silver is a great investment, and silver is a great asset to own. A recent study shows precious metals can increase gains by adding a small percentage of silver. But investing in silver does not meet his definition of an asset because his definition of an asset is putting money in the investors pocket–silver does not fit that definition. I’m a silver investor, and a silverbug, but I still recognize silver doesn’t provide income–silver investing hedges against inflation. Never have I seen my silver bullion write me a check. Silver remains a good investment for most people, and Kiyosaki will, most likely, say anything just to sell his next piece of entertainment.